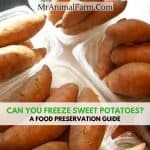 Can you freeze sweet potatoes? Recently, I asked myself the same question about mashed potatoes (right here, ICYMI). It turns out, not only can you freeze sweet potatoes, you should start freezing sweet potatoes. 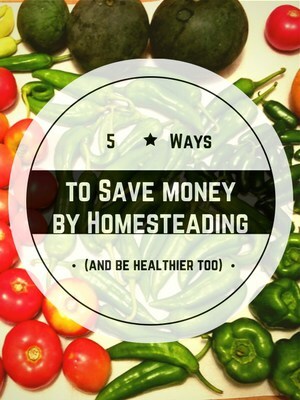 Not only does freezing sweet potatoes make frugal sense. 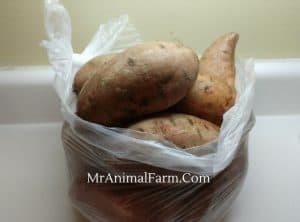 Freezing sweet potatoes makes time saving sense too! When we found the mashed potatoes on sale, we also saw the sweet potatoes were on a similar sale. So, just like the potatoes, we purchased around 50 lbs of sweet potatoes (I know, we need help). “How on earth can someone stand to eat the same thing in such large quantities?”. I have the same question. I know I couldn’t. “Well, surely you are out of your mind and AT LEAST half of what you bought will go bad and have to be thrown away!” Valid point, and you would be correct, if not for one thing. Whatever you want to call it. So we can take advantage of huge sales. Because we can save time preparing for large meals. We can have a quick bite to eat that isn’t a disgusting TV dinner. For all of these reasons, we are going to learn how to freeze sweet potatoes. First thing you want to do is make sure you have everything you are going to need. We use an Instant Pot for this project. 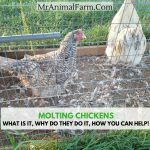 I like the Instant Pot because it is quick to clean and easy to use and I always get consistent results. After you have cleaned a large enough space to work, you will need to prep your sweet potatoes. I like to stick them in a collander in the sink and scrub them under running water. 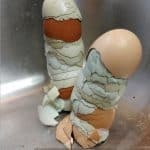 You don’t have to clean them this way, you can do it however you like. You do you. 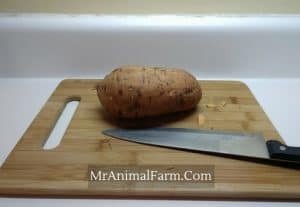 After you have your sweet potatoes clean, you will want to cut them. I always put them on one of our bamboo cutting boards and generally cut with a large kitchen knife. I like the bamboo cutting boards because they are easy to clean and when they dry, they do not typically grow bacteria. Can you freeze sweet potatoes whole? Probably, but they would be a pain to work with. 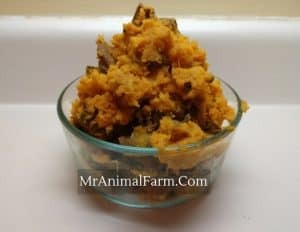 I cut the sweet potatoes into quarters so that they would easily fit into the Instant Pot. Since it’s a pressure cooker, the size of the pieces is not going to have much effect on how well they cook. 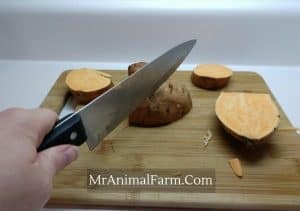 If you prefer, you can prepare the Instant Pot prior to cutting the sweet potatoes. This way, you can just throw the sweet potatoes into the Instant Pot as you are cutting them. It’s like your own little assembly line. To prepare the Instant Pot, you just add 1 cup of water and place the wire rack in the bottom. You can also use a vegetable steamer basket. Whichever you prefer is fine. The point is to keep the potatoes out of the water while they cook. After you have packed the Instant Pot you can lock the lid in place. Press the manual button on the front of the Instant Pot and set the timer for 20 minutes. 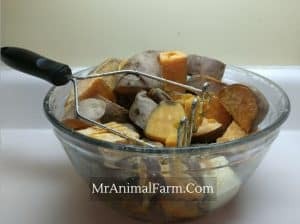 If you have a ton of potatoes and don’t want to wait in between Inant Pot batches, you can also add whole sweet potatoes and bake them in the oven. To do this, stab each sweet potato a few times with a fork. Preheat your oven to 425 degrees and cook for 45-50 minutes (Thanks, Healing Tomato!). Once your sweet potatoes are finished cooking, in the Instant Pot or oven, carefully put them into a large mixing bowl. They will be super hot and sticky so be extra careful. A glob of caramelized sweet potato sticking to your arm will have you yelling things you don’t want your kids to hear. Once in the bowl, take a potato masher and work out any internalized anger you may have on the softened spuds. Here is where you will add in your butter and milk. We used 2 TBS of butter and 1/2 – 1 cup of milk depending on the size of the batch. But you can vary this according to your own personal preferences. You can let the potatoes sit and cool for a while or you can start scooping and freezing right away. We have noticed no difference in quality either way. 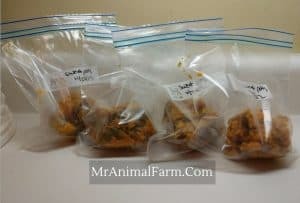 Using a 1 cup measuring cup, we put a serving into a prelabeled ziplock freezer bag. You can then flatten the bag and push any excess air out. Make sure you write what you are freezing and the date. Each bag should keep for up to a year. Now you can put an entire stack of flattened bags of mashed sweet potatoes into your deep freezer. 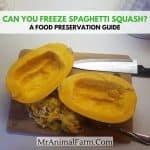 So, can you freeze sweet potatoes or not? Of course you can! Now you have an awesome and tasty side dish already cooked. The work great for special family dinners, a quick lunch snack, or any occasion really. To prepare, just leave them in the fridge overnight, reheat in the oven, Instant Pot, or microwave.